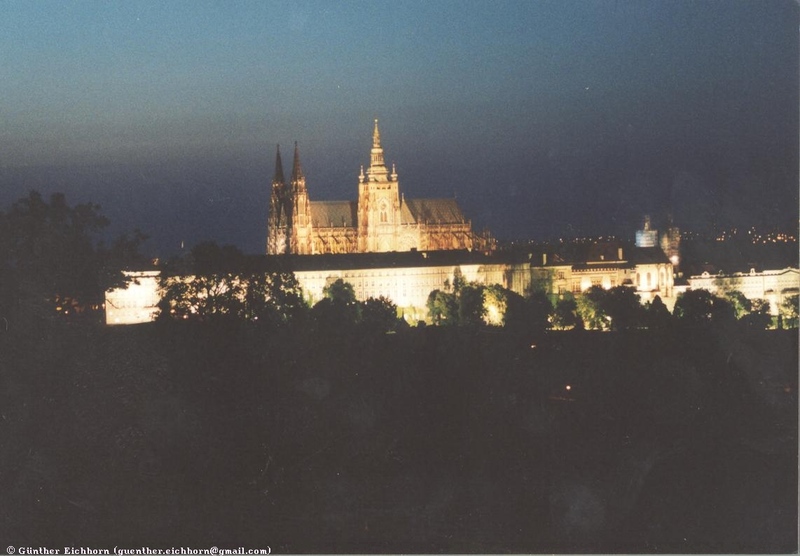 In June 2002 I visited the Česká Republika (Czech Republic) during a trip through Central Europe. 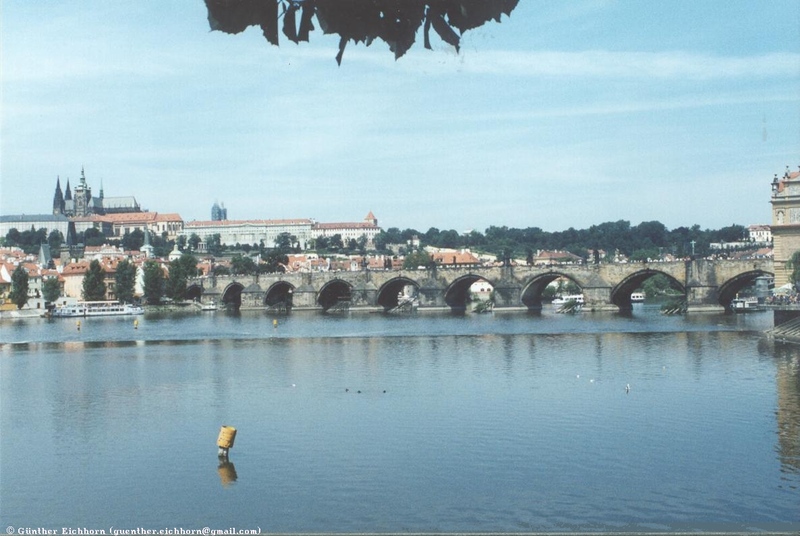 I flew into Prague from Germany, rented a car there, and started my trip to Hungary, România, Slovakia, Poland, and Lithuania. 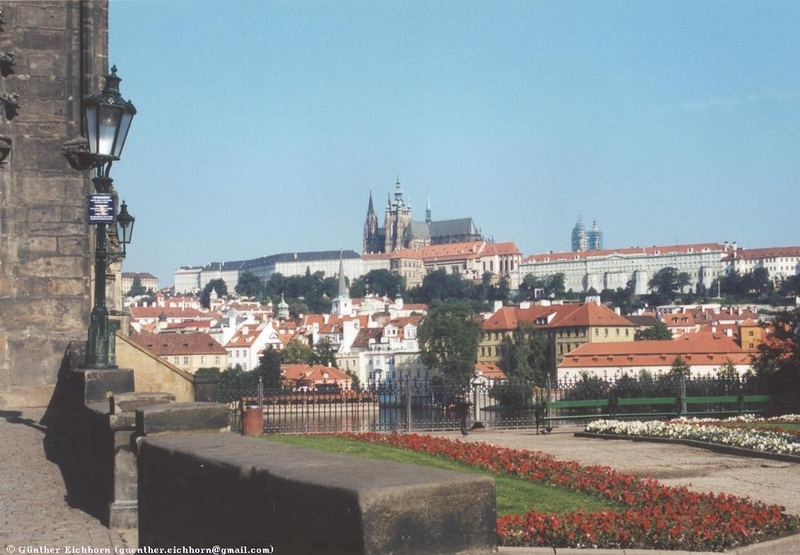 From Poland I returned to the Czech Republic. 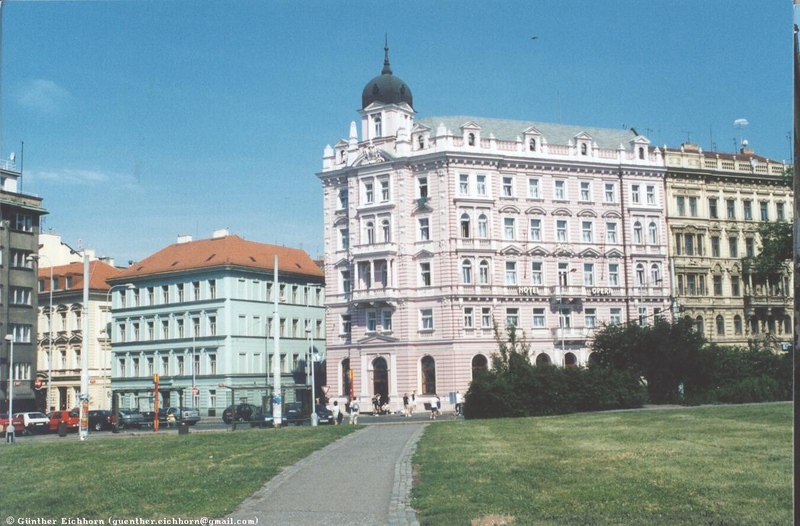 I drove around the northern and western parts of the Czech Republic, visiting several World War II memorials and lots of castles. 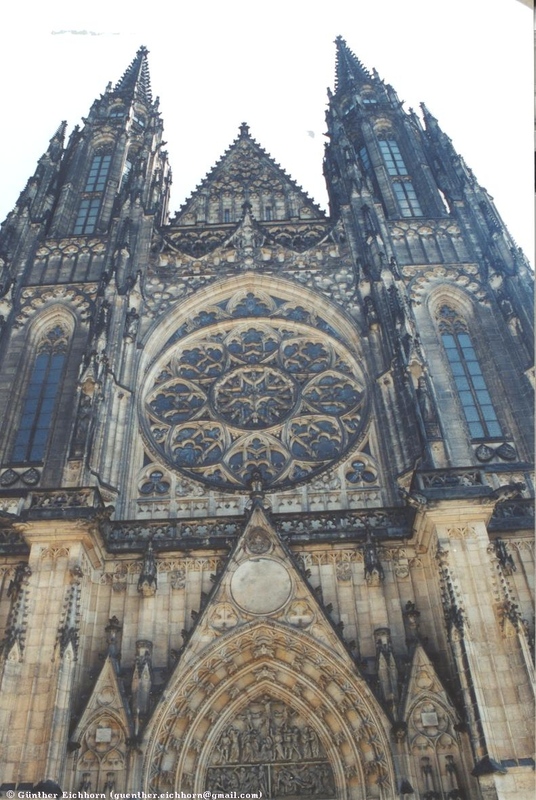 I spent one week in Prague at a conference, and then had another few days for sightseeing. 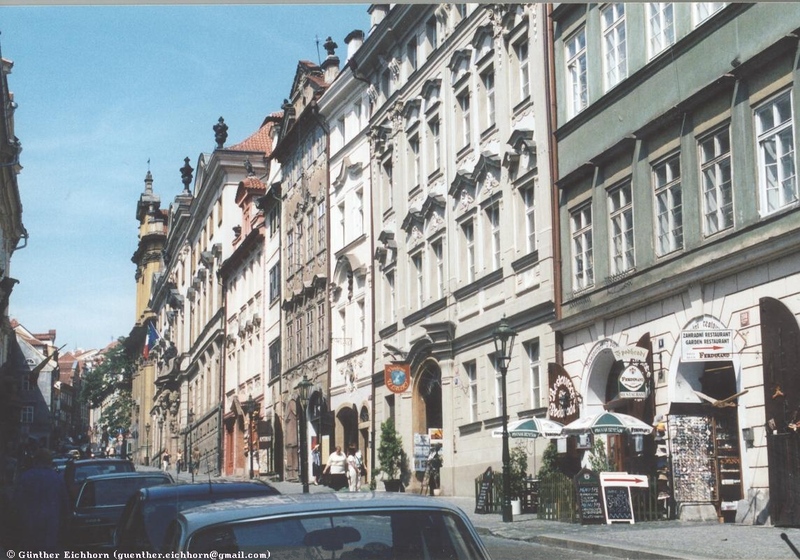 Prague is a beautiful city that has been restored very well. 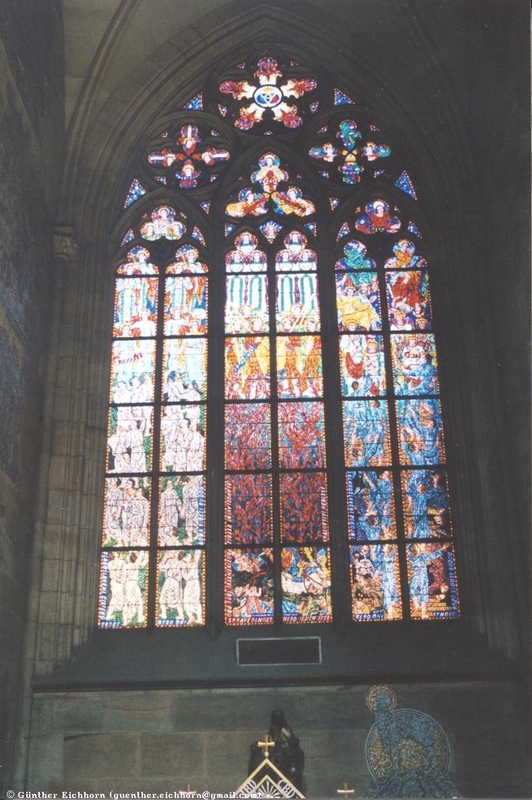 The Historic Centre of Prague is a UNESCO World Heritage Site. 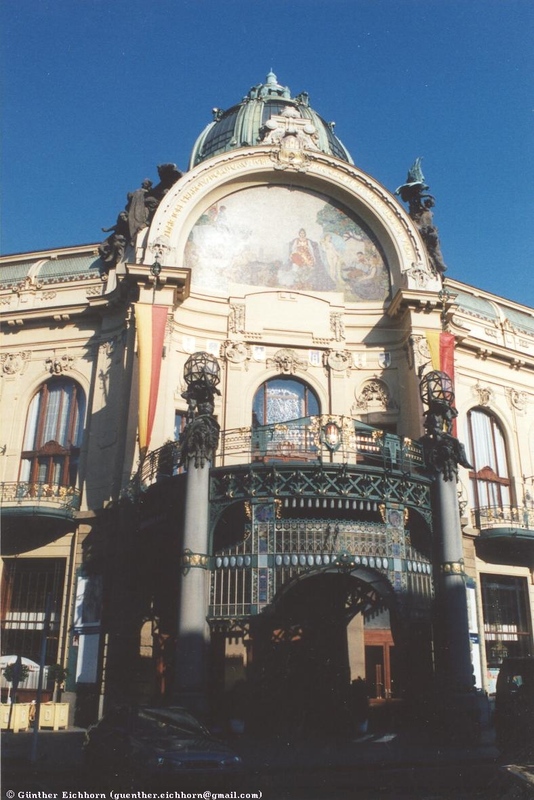 Prague has lots of interesting architecture. 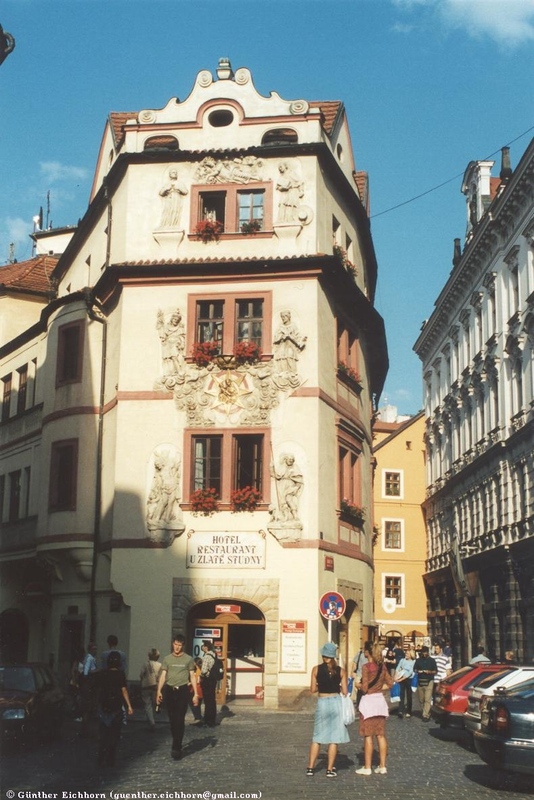 Staromestské Námestí, the Old Town Square is a favorite tourist spot and usually very crowded. 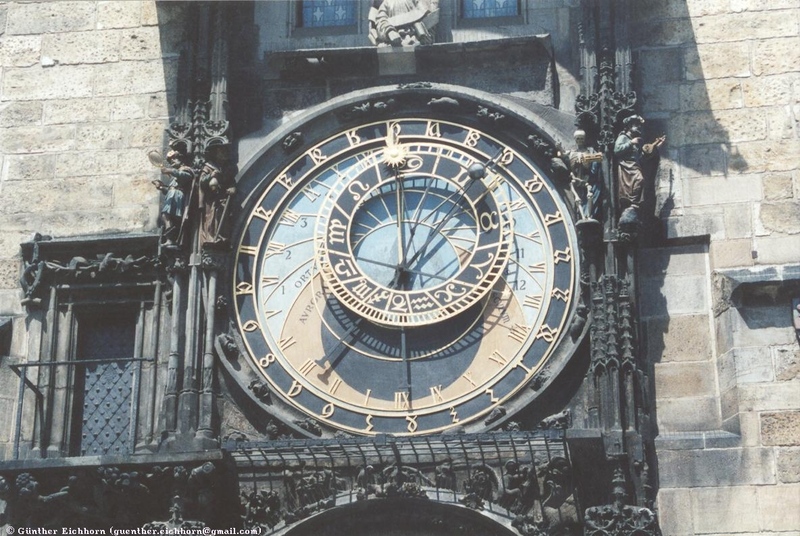 On the 14th century Old Town Hall is a very interesting astronomical clock. 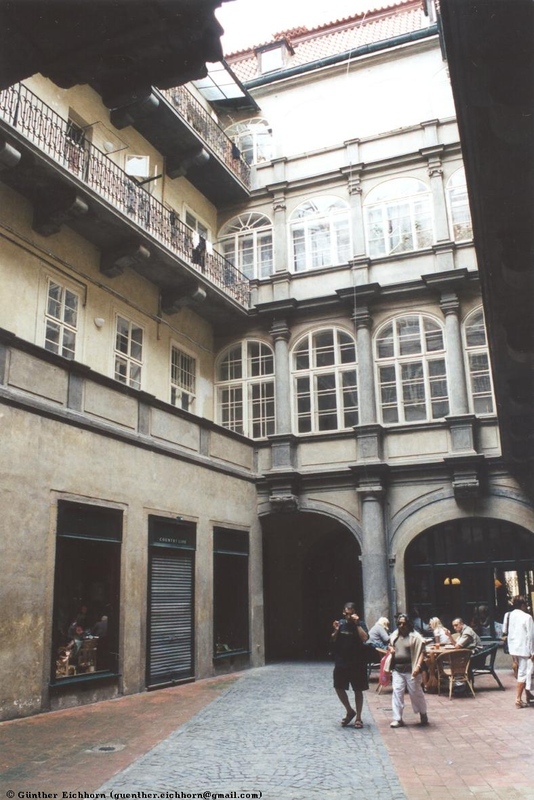 All of the Old Town is a maze of courtyards and passages. You can walk through most of the old town by just going from one courtyard to another through these passages. 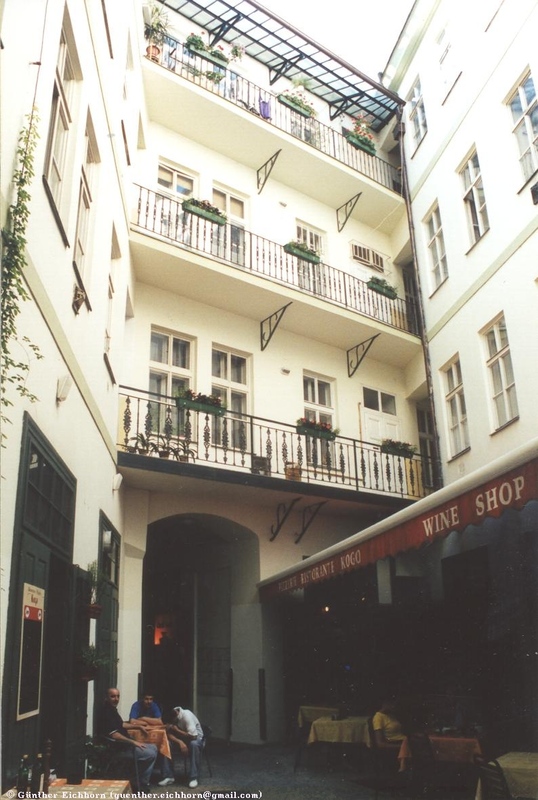 Many of these yards have restaurants and small stores. 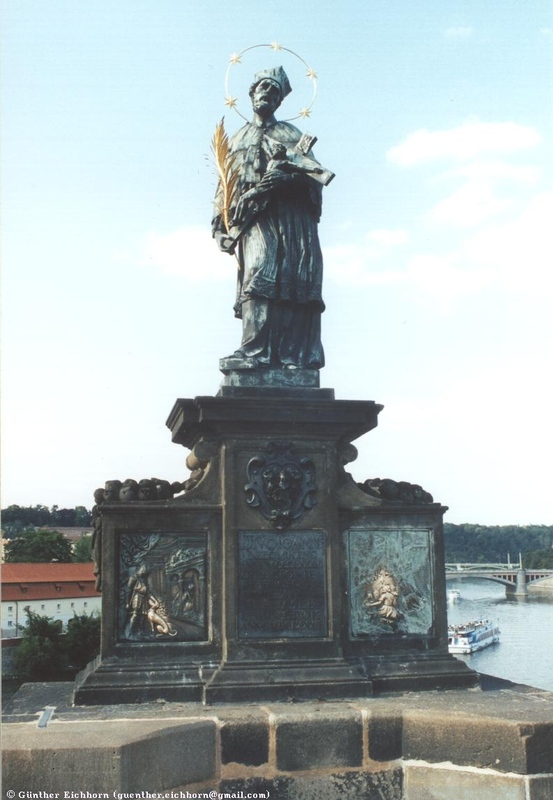 The Charles Bridge is another one of the famous sites in Prague. 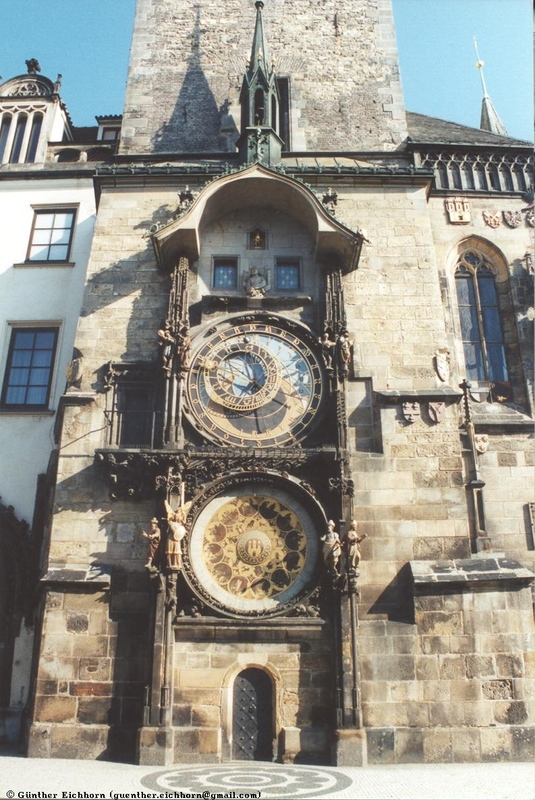 It was started in 1357 by Charles IV. It is usually very crowded with dozens of vendors selling souvenirs, making music, and painting portraits. 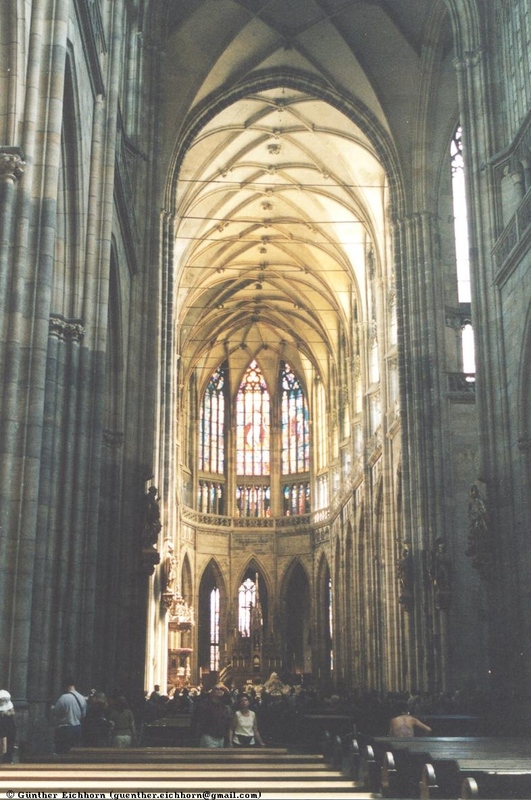 St. Vitus Cathedral is on the site of a Romanesque church, first built by Duke Wenceslas in 929. 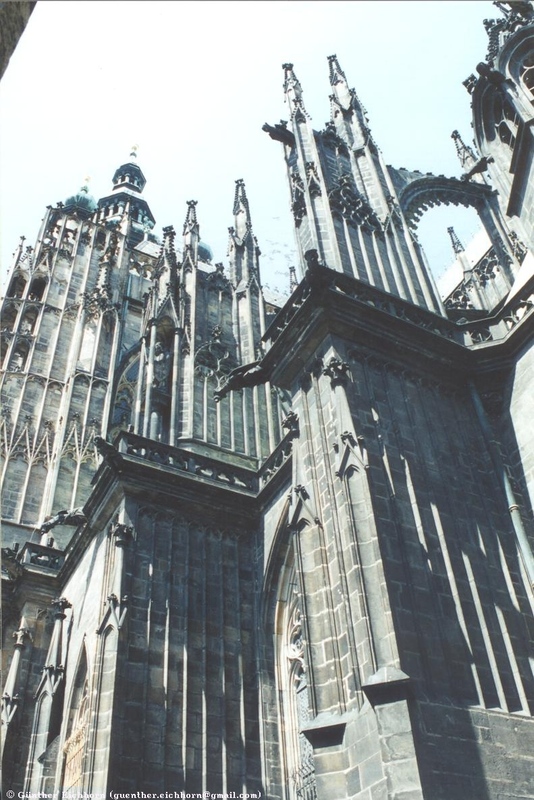 It is a huge Gothic cathedral from the 14th century. 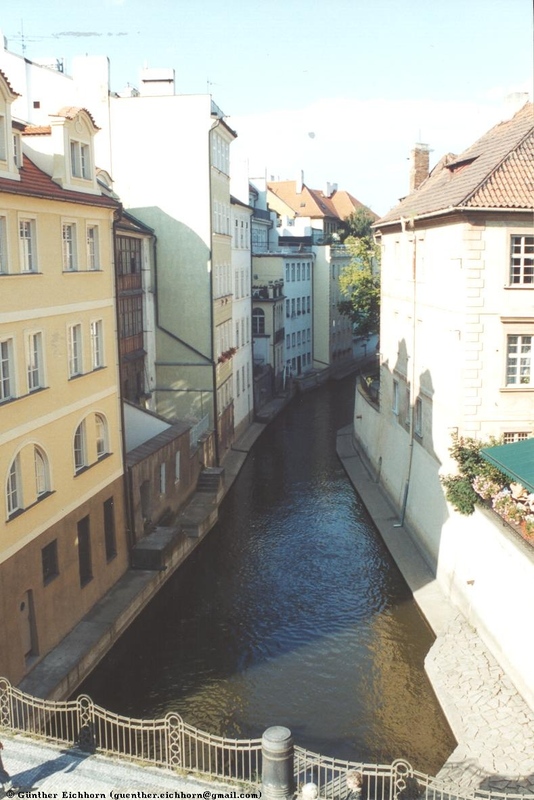 About one month after I visited Prague, it was inundated by the flood of the century. Many buildings were damaged or destroyed by this flood. Hopefully it can all be restored again. 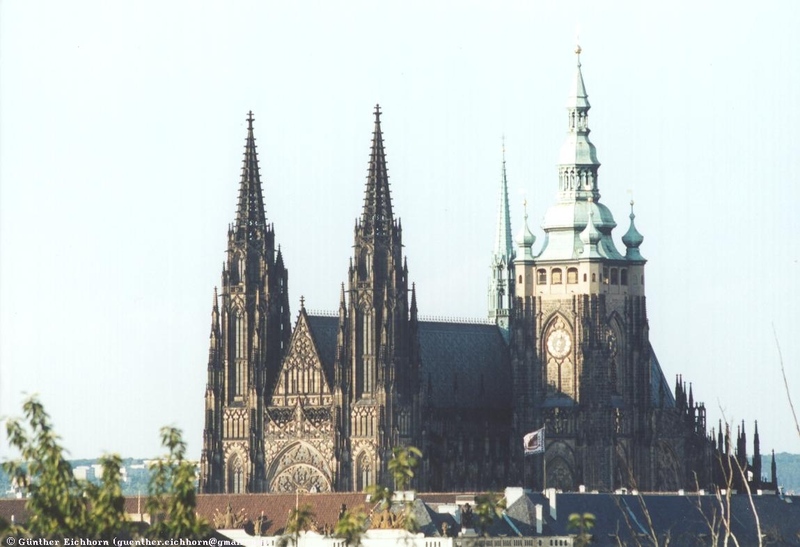 Around Prague are scores of castles. 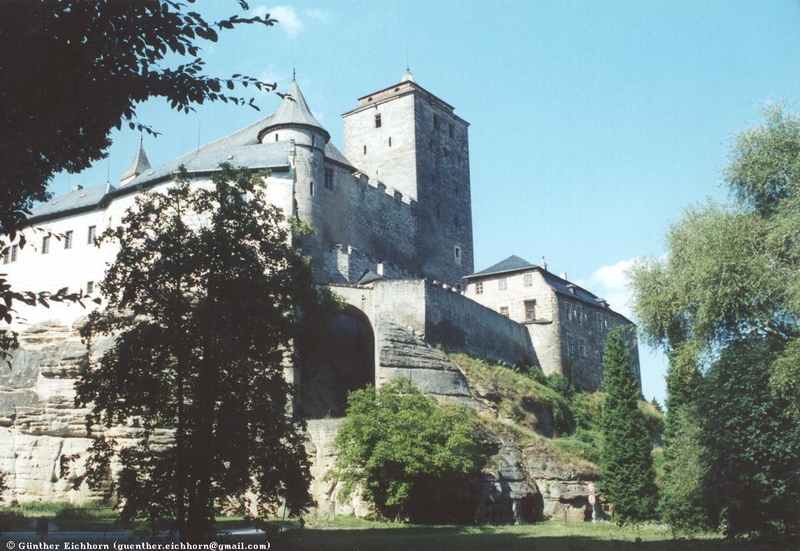 The best know is probably Karlstejn Castle, about 20 km (12 miles) south-west of Prague, founded in 1348 by Karel IV (Charles IV). 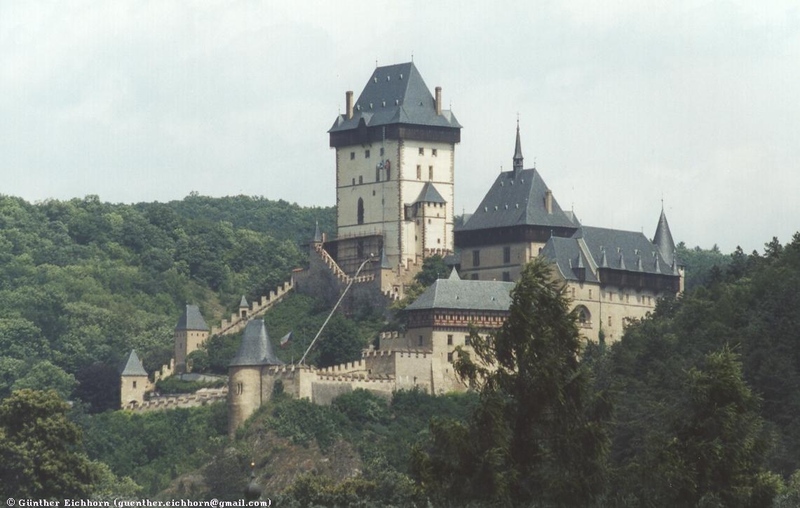 Kost hrad (Kost Castle) is a beautiful Gothic castle about 90 km (56 miles) northeast of Prague. 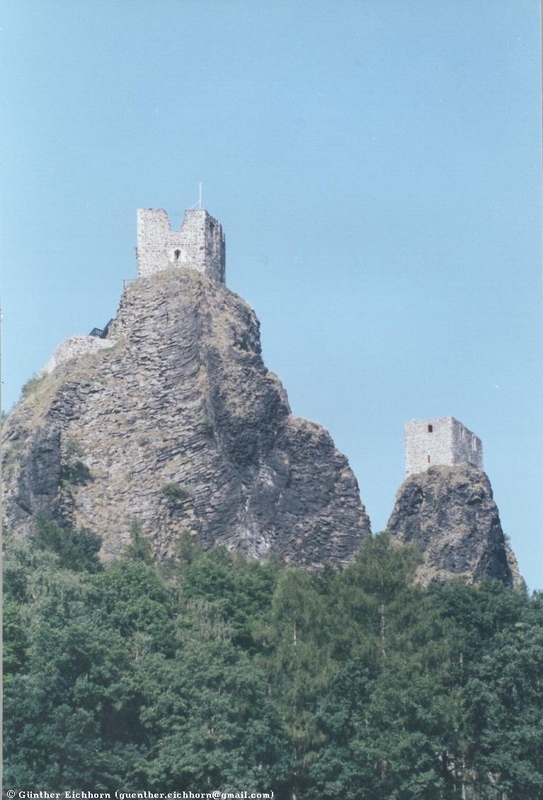 Trosky hrad (Trosky Castle) is a striking castle ruin sitting on two basalt towers that can be seen for miles. It was built in 1380. 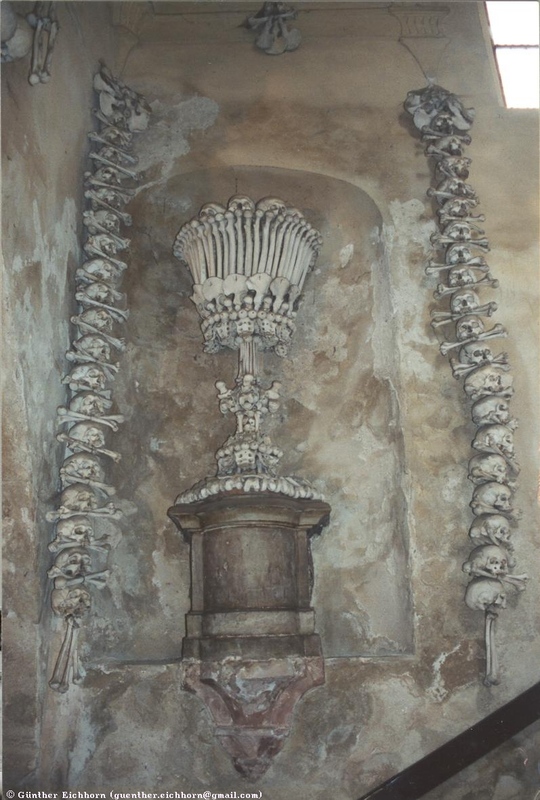 To the north and west of Prague are Terezin and Lidice, two memorials of the Nazi Holocaust. 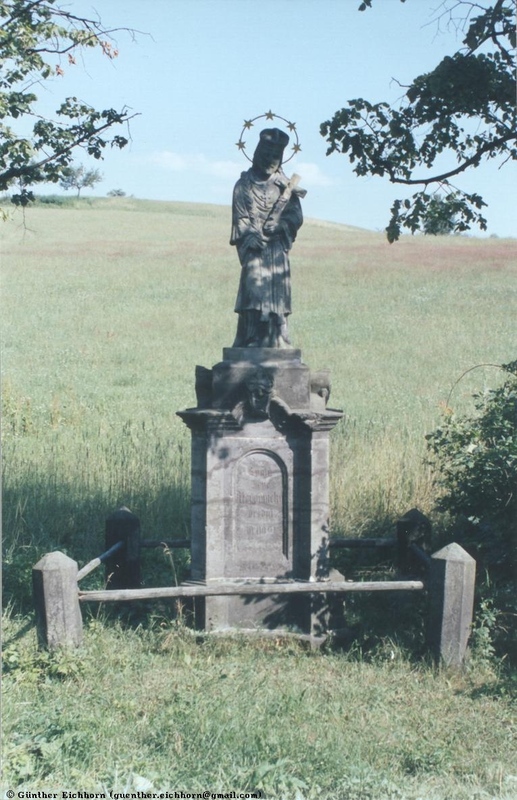 Near Hredle, about 40 km (25 miles) west of Prague are the Kamenné rady u Kounova (the Kounov Stones). It is an area of about 2000 small menhirs (standing stones) from the Neolithic period. 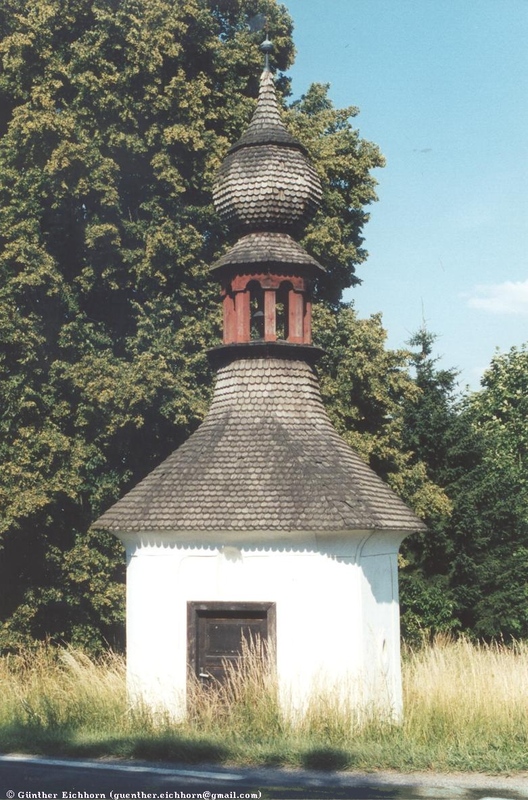 They are similar to sites found in western Europe, but are the only such site in central and eastern Europe. It is no Stonehenge, but interesting to visit nevertheless. 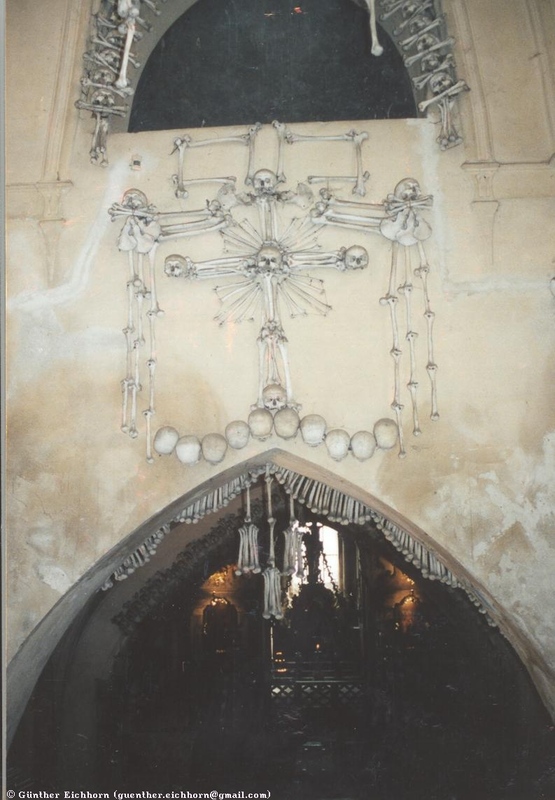 The most interesting place that I visited was the Ossuary Chapel in Sedlec, today a suburb of Kutná Hora. 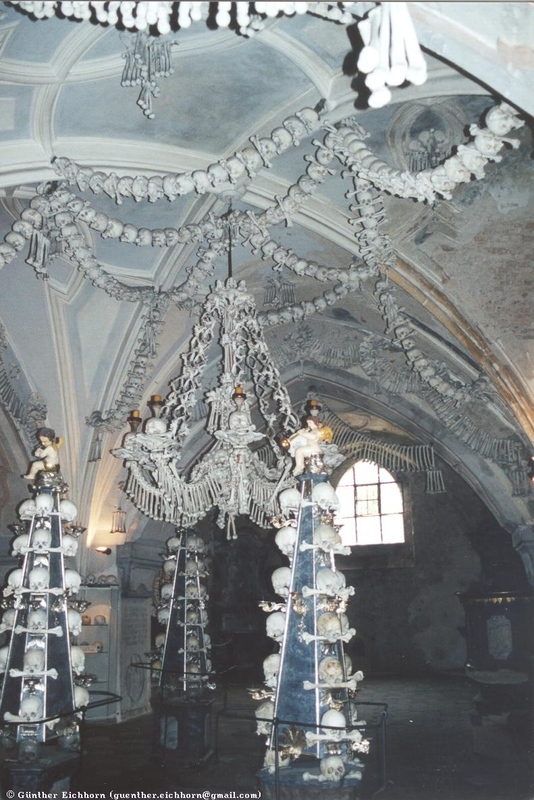 The cemetery started in the 12th century with the founding of Bohemia's first Cistercian monastery in 1142. 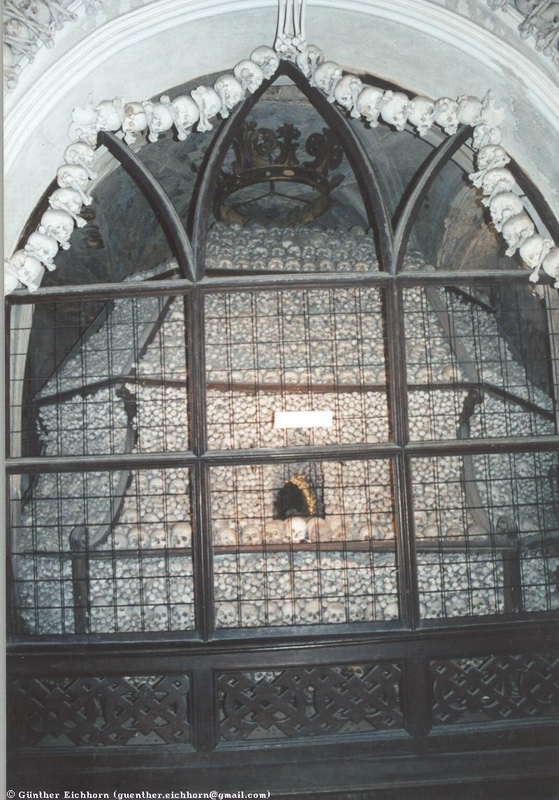 In the 13th century, the abbot brought back some soil from Jerusalem and spread it over the cemetery. Because it was now Holy Ground, everybody wanted to be buried there. 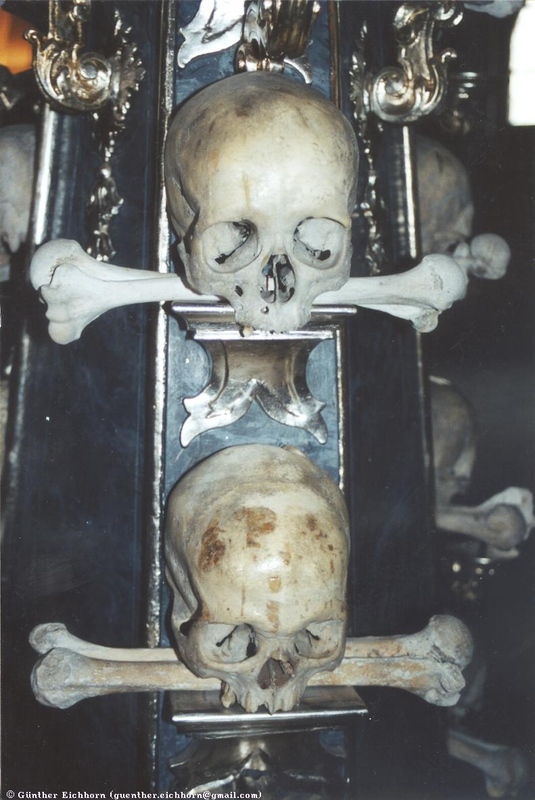 That, together with the plague in the Middle Ages assured huge demand for graves in that cemetery. 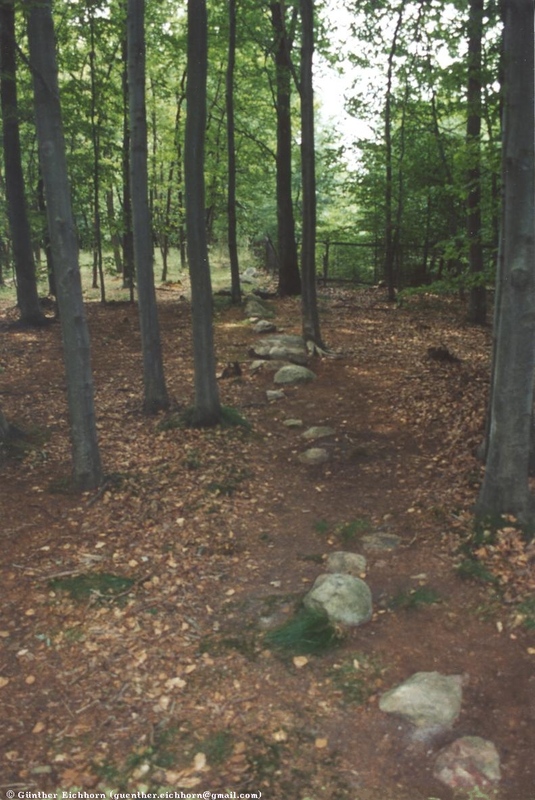 Within a century there were tens of thousands of bodies buried there. 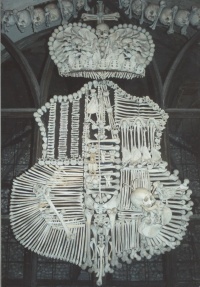 Since there was only so much room, whenever a new body was buried, the bones of the previous occupant had to be removed. 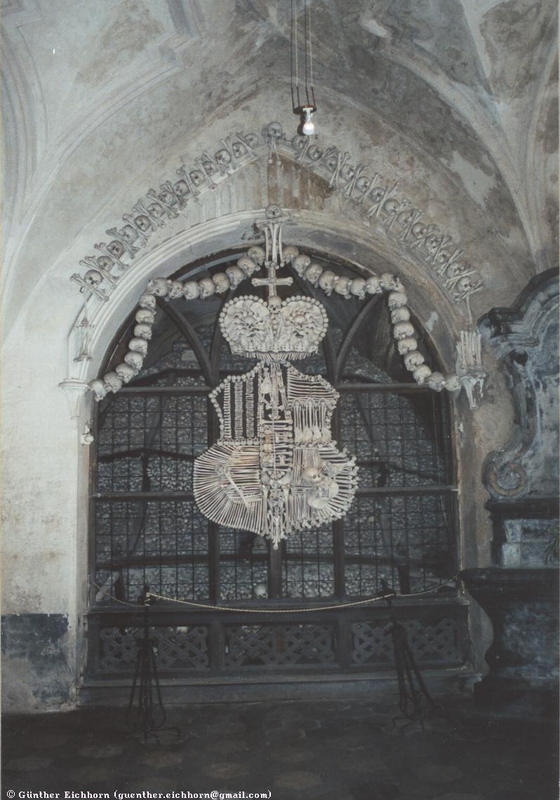 The 14th century All Saints Chapel (kaple Vsech svatých) was used to store the bones, first outside under the roof, then inside. 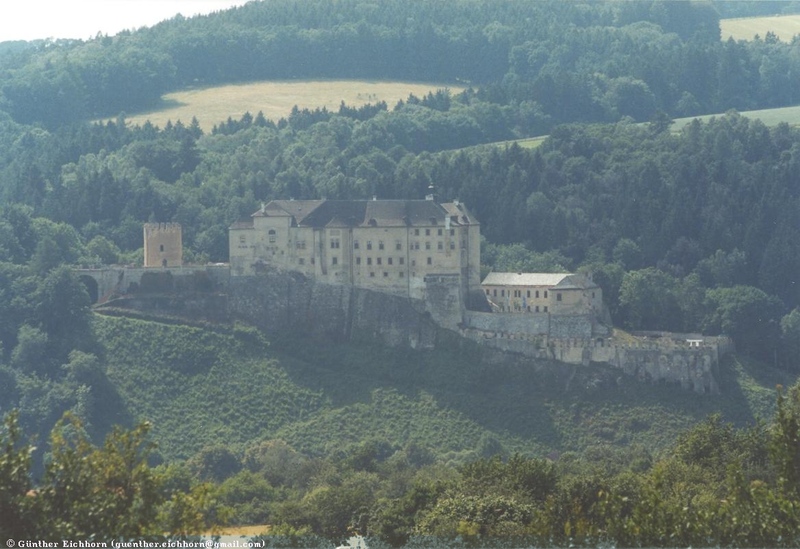 In the late 18th century the Schwarzenberg family bought the monastery. 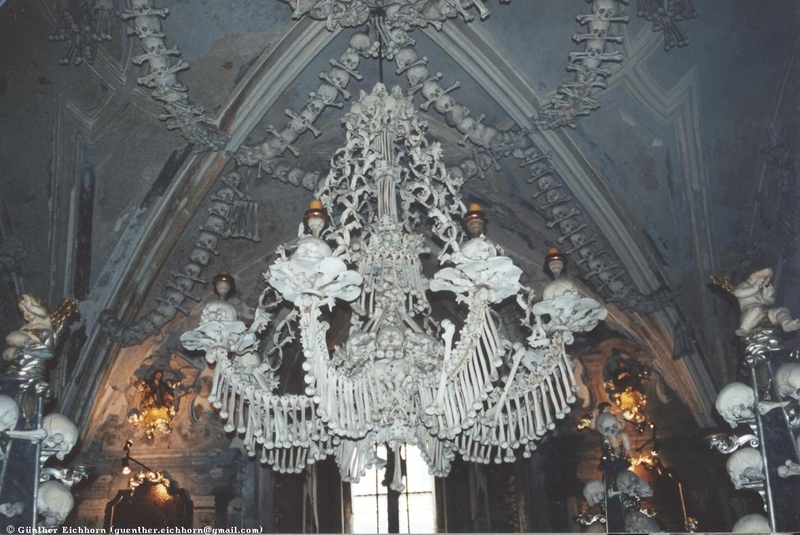 In 1870 Frantisek Rint, a Czech woodcarver used the bones to decorate the chapel. Among others he created the Schwarzenberg family coat of arms in bones. 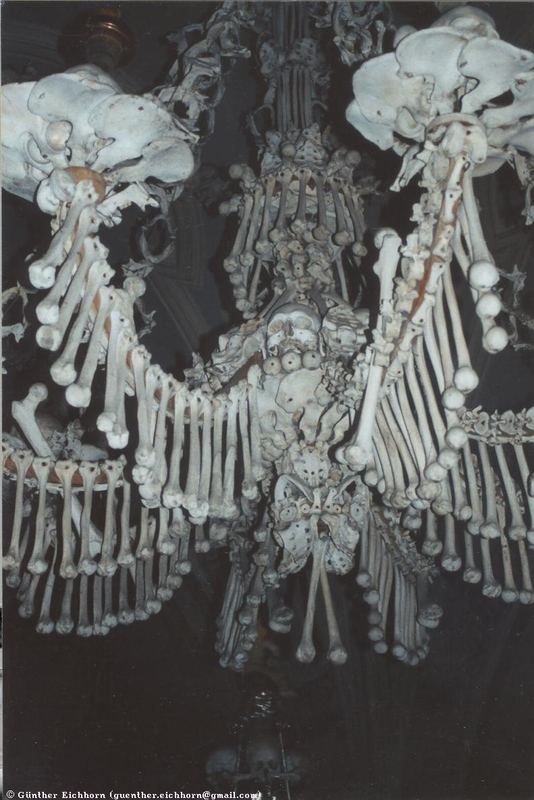 The chandelier is said to contain at least one of every bone in the human body. 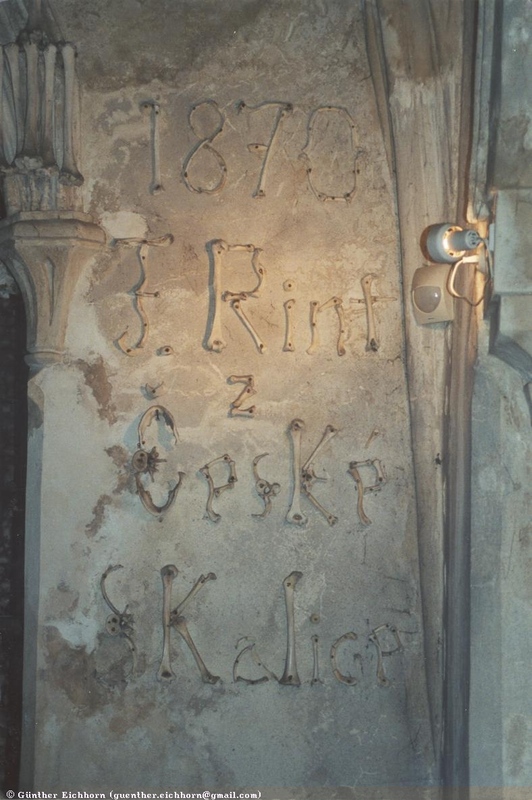 Rint signed his name and date in bones on one of the walls of the ossuary. 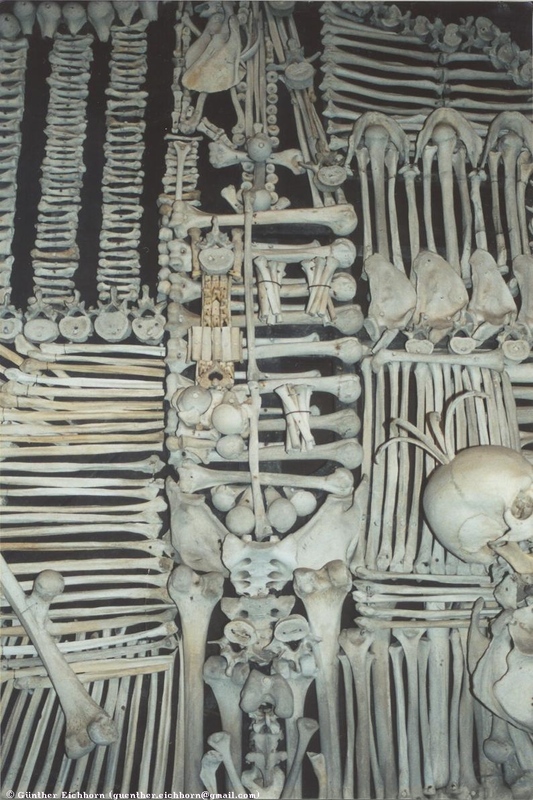 The unused bones were neatly arranged in four huge piles, each holding about 6,000 skeletons worth of bones. In the last few days I visited the Krkonose (Riesengebirge in German which means Giants Mountains). It is an area that I heard about a lot in fables as a child. It was interesting to finally see this mountain range with its highest peak the Snezka (Schneekuppe in German). It is a beautiful mountain range. Unfortunately the forests there are severely damaged by acid rain. Wild flowers are abundant and beautiful. 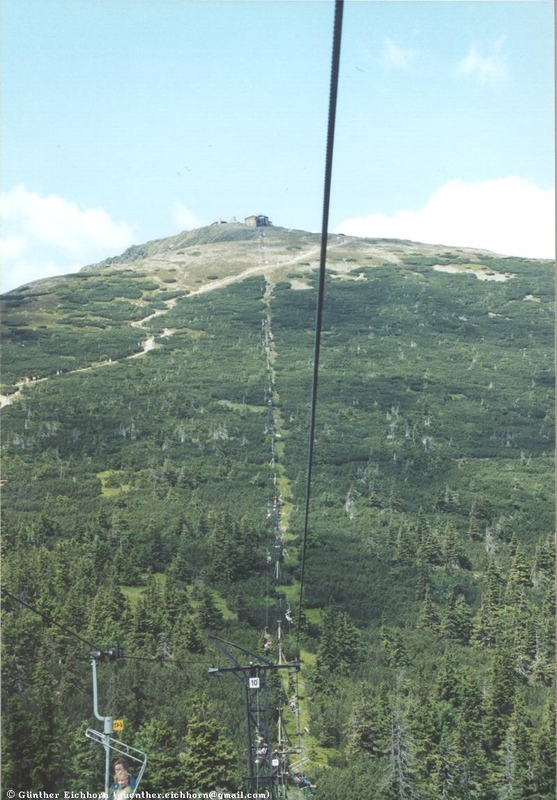 The Snezka peak can be reached with a chair lift. 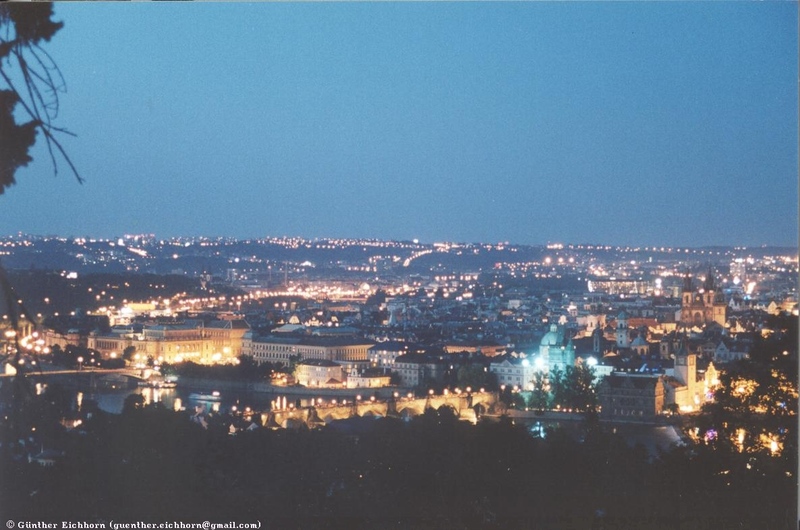 It provides a great view over the Czech Republic and Poland, since it sits right on the border between the two countries. Riding up to the summit you can see plenty of trees killed by acid rain. Some areas are almost completely denuded, but others seem to be recovering somewhat. 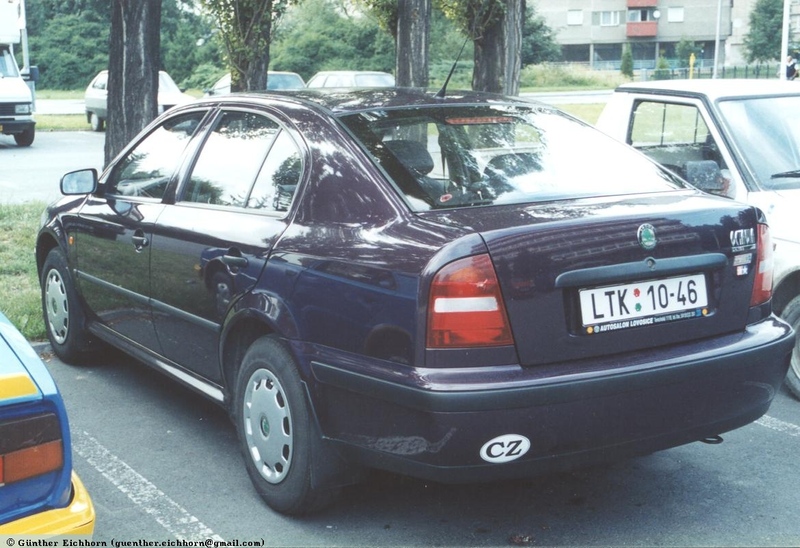 Traveling by car in the Czech Republic is no problem. You can find hotels anywhere. You can get money from money machines with your regular bank card anywhere in the Czech Republic. 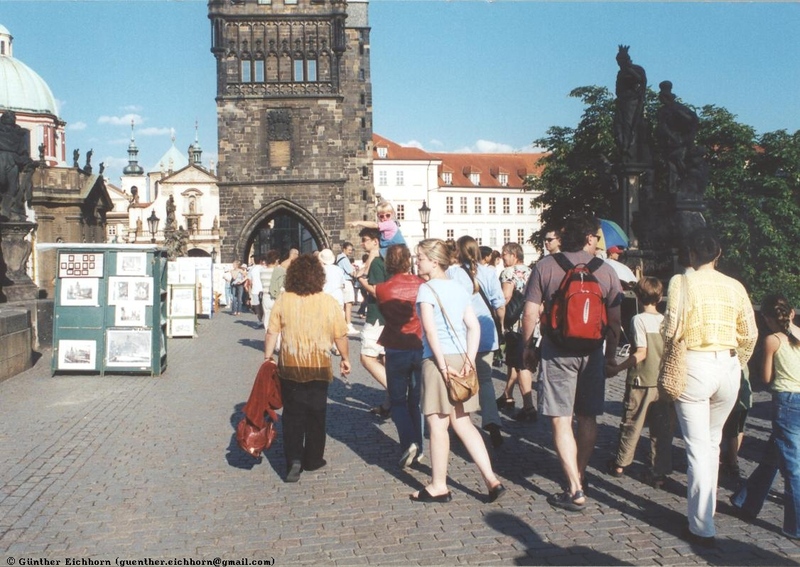 Traffic in the cities is usually quite heavy, especially in Prague. You have to be quite a distance from Prague before the traffic eases up. The roads are generally very good. I tried to take smaller roads as much as possible. It turned out that even the smaller roads are generally very good. Cars are usually very modern. 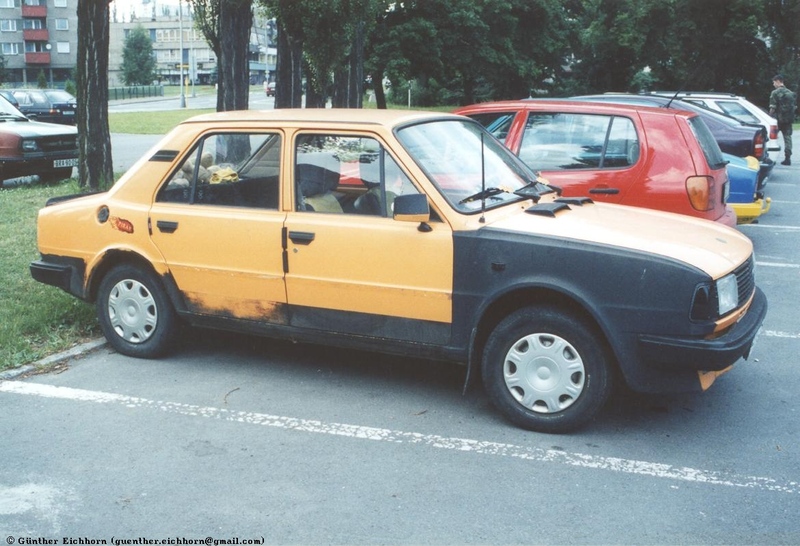 The new models of Skoda are very nice cars. However, sometimes you can still see remnants from the Soviet era. 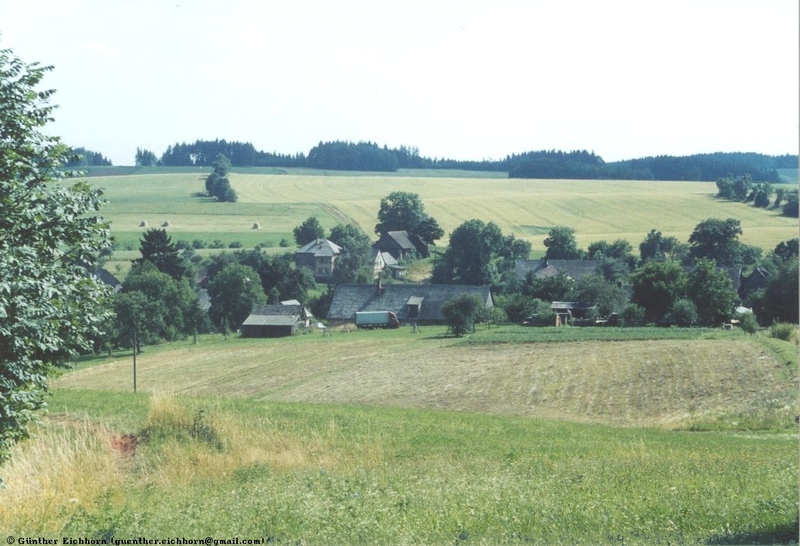 Most of the Czech Republic is gently rolling hills. In the northern parts are the Krkonose mountains (Riesengebirge in German, which means Giants Mountains) and the Sudeten mountains. 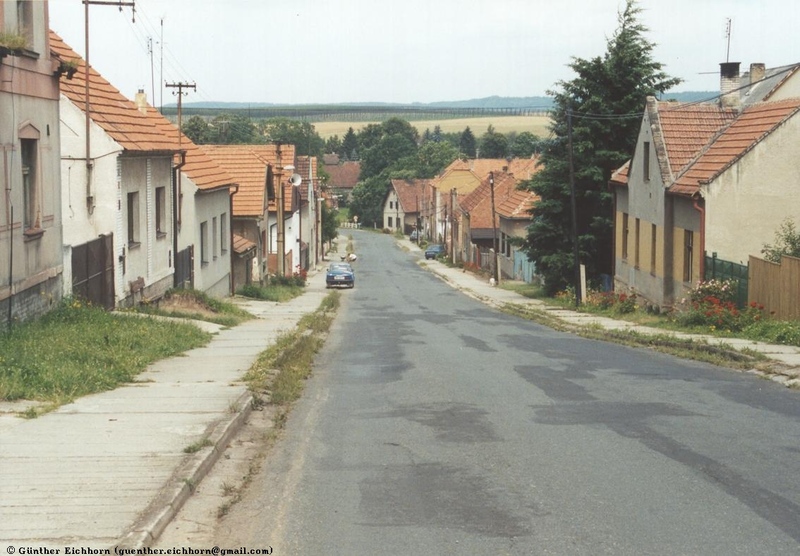 As opposed to the villages in Hungary for instance, houses in the villages in the Czech Republic don't have the gardens in front of them. 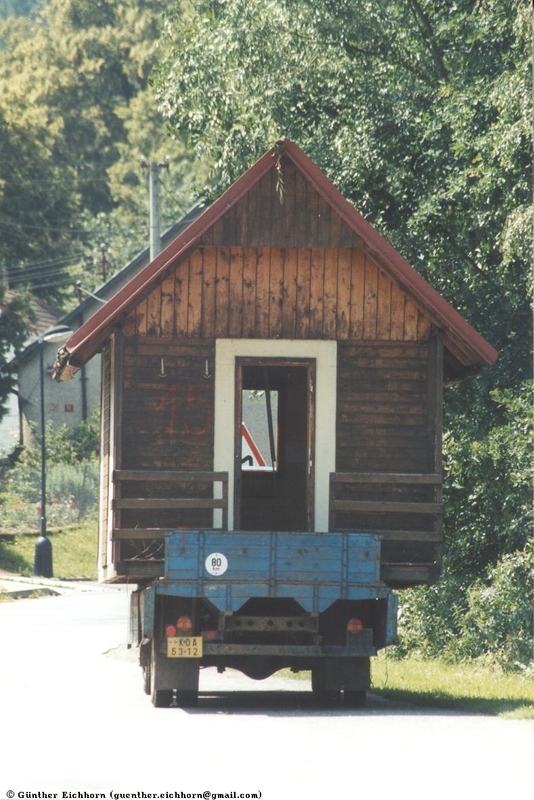 They are usually built directly on the road, much like villages in Germany. Religious symbols can be seen frequently along the roads. 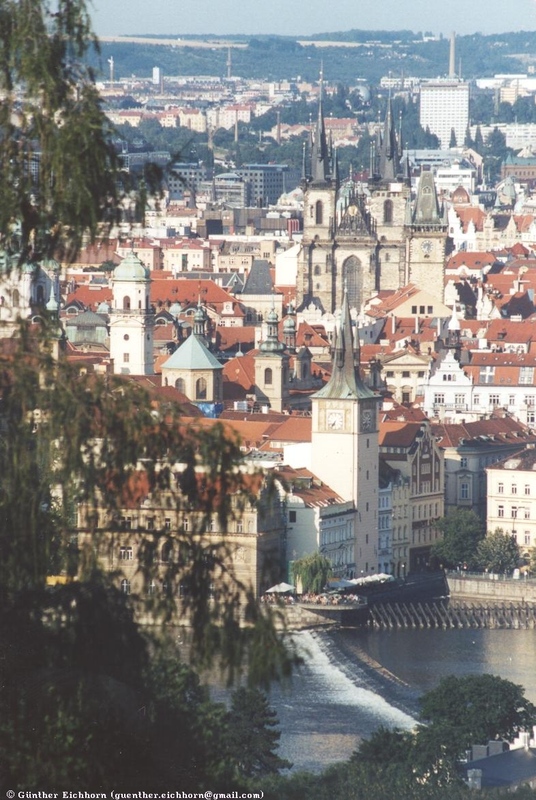 It seems as if the Czech economy has pretty much caught up with western Europe. 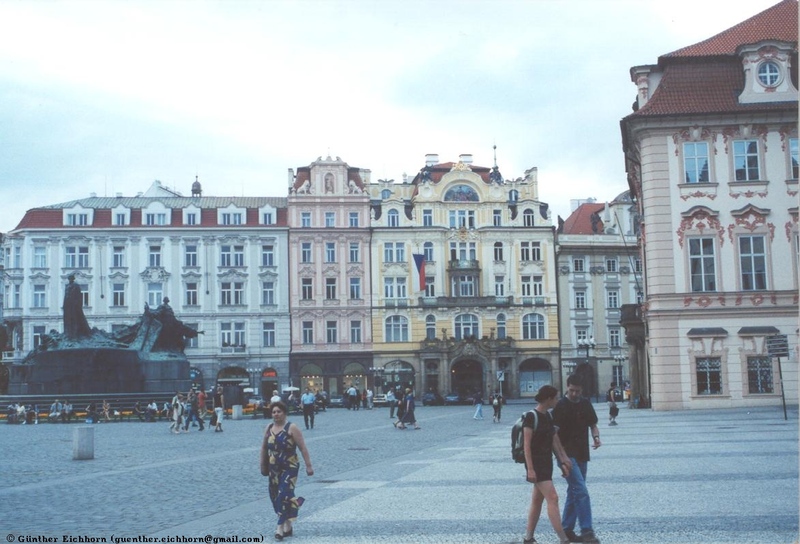 The feeling that I had was that the Czech Republic is in the best shape of all the countries in central Europe. 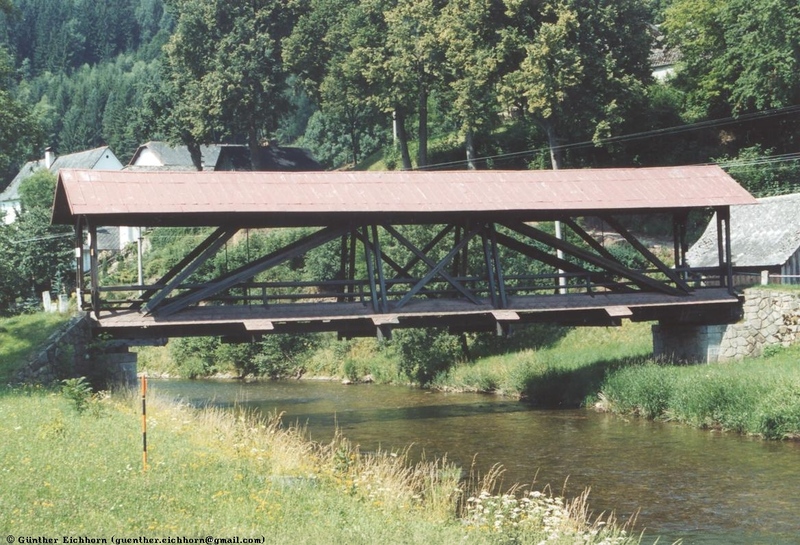 I have some of the pictures of nature in the Czech Republic on a separate page. Another separate page has reminders of the Nazi Holocaust.